Can you see the trees showing off their golden and rust colors? It's time for Autumn plantings, cool mornings and beautiful sunsets. Autumn has arrived and it's time for change. The days are still warm and cool evenings bring out the hand knitted rugs and mugs of hot chocolate. Stonehouse is bursting with quality and affordable Australian hand crafted treasures for your home and gifts. There are handmade ceramics, glass and artwork for your walls, unique jewellery and gifts for that special friend and loved one. Amazing hand crafted wooden boxes and woodwork for the discerning man. Lovers of textiles will be delighted by the beautiful scarves and garments created by our textile artists. There is plenty to see at this time of year and we have changing Exhibitions & Features every month. There is truly something for everyone at Stonehouse. For the month of April, makers and artists will be demonstrating and making their work in the gallery. 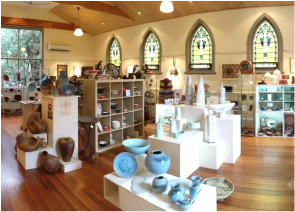 Jewellery, textiles, glass, ceramic and timber works, hand crafted by talented local and Australian makers. Our member artists and makers are happy to create custom products, corporate gifts and special commissions on request. Please note, for the safety of our customers and staff we do not open on days that are rated by the CFA as﻿ Code Red﻿, ﻿Extreme﻿ or ﻿Severe﻿.